An outdoor warning system was installed on The University of Texas at Austin main campus in February, 2007. The system uses siren sounds to alert the campus community to take shelter in the event of an emergency, and the university plans to test the system once a month. The university is dedicated to ensuring everyone knows what to do when they hear the sirens, so we have provided an article about the siren system and the below answers to frequently asked siren questions. What do the sirens sound like? The system tests take place at around 11:50 a.m. on the first Wednesday of every month. The tests last one minute, and you do not need to take any action during the test. If a severe weather warning is issued for the area on a scheduled test day, the test will be cancelled for that month. What should I do during a system test? You should continue your regular activities during a system test. You do not need to take any special actions during a test. A system test will only take place around 11:50 a.m. on the first Wednesday of the month, and will never last longer than a minute. In the event of an emergency the sirens will sound until the emergency is over, at which point you will hear an “all clear” announcement. When you hear the sirens you should seek shelter immediately. Enter the nearest building and move into interior corridors away from windows. Close all doors to rooms with windows, and move to the lowest level of the building. Remain inside until the sirens stop and you hear the “all clear” notification. The sirens indicate emergencies that make it unsafe to be outdoors and require you to seek immediate shelter. The most likely cause of these unsafe outdoor conditions is severe weather, but other causes may include the unlikely occurrences of an environmental hazard or an armed individual on campus. The sirens are only used for emergencies that impact or present a danger to the main campus. For example, the sirens will not be sounded for a tornado watch in Travis County, but they will be sounded if there is a tornado on the ground that has the main campus in its forecast path. 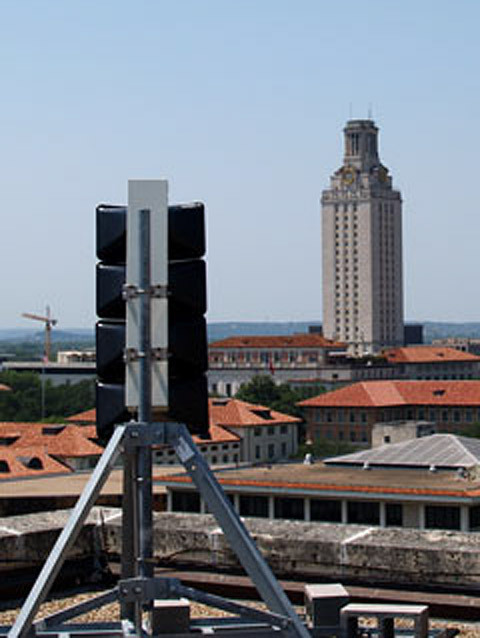 Siren speakers are located on top of four buildings of The University of Texas at Austin main campus. There are siren arrays on the roofs of the Beauford H. Jester Center, Jesse H. Jones Hall, Jesse H. Jones Communications Center B, and Printing and Press Building. Where can I hear the sirens? The sirens are loudest within the outer limits of the main campus, or within six-tenths of a mile from the point of a siren. They are audible on both the west and east sides of I-35, and are designed to be heard outdoors. You may not be able to hear the sirens if you are indoors or are listening to music, mowing grass, or using a hairdryer. In the diagram below, the dark blue border represents the area in which the sirens are loudest.